Mommy’s lap was the best place to be. Sophie loved to play there, and hear stories there, and sometimes fall asleep there…But one day Sophie’ noticed that something was wrong. Mommy’s lap didn’t seem to be quite big enough anymore. I wrote this short picture book for very young children in 1986, when my daughter was seven months old. As I pushed her stroller through our Los Angeles neighborhood, I started thinking about when the right time would be to have a second child. That thought led to the question of how Sophie would react to a sibling vying for her parents’ attention. 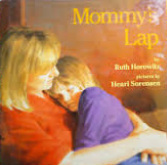 And that thought led to the sentences that ended up in Mommy’s Lap. This is the first book I wrote and the first one I sold to a publisher. But the road from contract to publication was filled with unexpected detours and breakdowns. By the time the book came out in 1993, Sophie was in the second grade, her little brother Sam was getting ready to start kindergarten, and my second book, Bat Time, was already in book stores. I am grateful to Henri Sorensen for his lovely illustrations.